Got tagged by the hilarious Chuva Nosebleed and motion seconded by the gregarious Diwata. The tag’s rule is to state in handwriting the top three things I’m addicted to. This is interesting because through this meme I’ve got the chance to introduce my hubby’s latest creation. My handwriting is actually installed in my computer so I don’t need to grab the cam and shoot it. Last month, hubby asked me to write something on a piece of paper. He said that what I should write should contain all the letters in the alphabet. So I jotted down the keyboard’s familiar letter-finger-placement-practice the quick brown fox jumps over……. After tediously polishing every letters, he generated it through a software program into fonts. He named the new font “Leimar Handwriting”. The text in my header is actually my handwriting, too. O, di ba, Chuva…. ibebenta ko yan, hehe! Ano na naman yun, diwata. Baka puro tag na lang laman ng blog ko nito, haha! 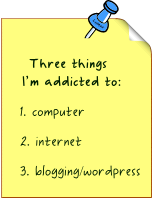 Haha, Ria, we’re not the only addicts!